After clicking that link you should see a full list of your caches, similar to below. The types of caches may vary depending on what extensions/FPCs or even Varnish modules you have enabled. In the above case, we see this site is using the standard Magento caches alongside Varnish through the Turpentine module. Caches that are invalidated with show up as Invalidated in a red bubble under the Status column. Invalidated is nto necessarily bad, it just means the caches are out of date and could be serving older content. Log into your Magento admin. 5. Hit Submit, those caches are now refreshed/flushed for you. 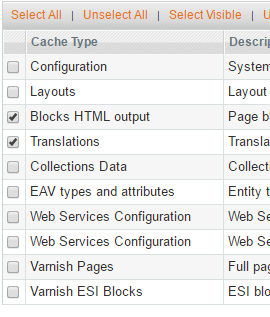 Alternatively, you can flush every cache by clicking the near the top right of the Cache Management area. If your site is using Redis-cache, the above methods should still work to clear/refresh the cache. But you can also flush redis specifically on our servers by running this command on our servers via SSH.